As a sort of Christmas gift to myself, I recently ordered a few new books that needed to have been on my shelves all along and which were conspicuous in their absence. Shiny new copies, y'all, not even from the used shop. 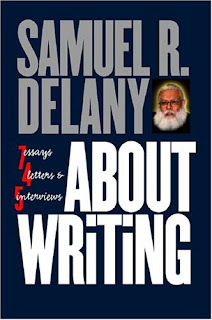 Currently, I am browsing through Samuel R. Delany's book of essays, interviews and letters About Writing. While I haven't read all of it yet and have been skipping around in it, I have been finding it very thought provoking. Aside from being one of the great spec fic authors, Delany is an English professor and this book occasionally takes me back to my days as an English major and the kind of reading that I did a lot more of back then, but it's generally a lot livelier than some of that was. 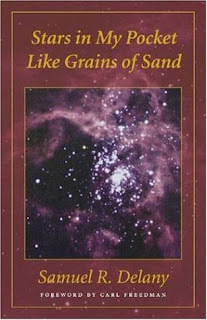 Also from Delany, I got this nice "deluxe edition" of Stars in My Pocket Like Grains of Sand. This novel I have read a couple times before but was lacking a copy in the permanent collection. I first read it when I was a teenager and I know I didn't fully appreciate it back then. I got it from the library just last year and was blown away by it. 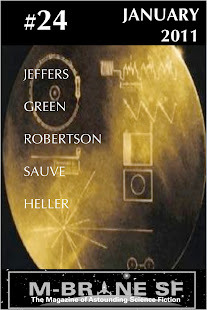 This is an awesome, star-spanning sf novel of many worlds and civilizations and races. If anyone ever wants to know what I think is a great sf novel, then this is a good one to which to point. I also scored these collections by Jack Vance and James Tiptree Jr. (Alice Sheldon). Most of the content of these I have encountered elsewhere before, but my own shelves were sadly missing these authors. 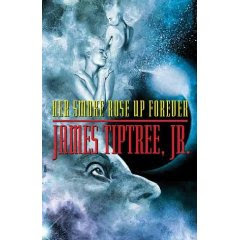 Indeed, there is a sad and shameful paucity of Tiptree titles in print currently. She wasn't necessarily the most prolific writer ever, but she has a lot more out there than this one single title. But if there's only to be one, then this is probably the one to have. 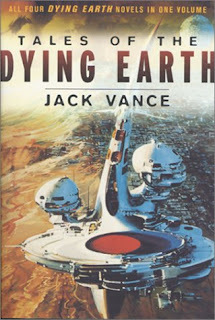 The Vance book collects the four Dying Earth books under one cover, and I am looking forward to returning to that soon. I had also planned to get, at long last, my own copy of another long-time favorite, Alfred Bester's The Stars My Destination. It's a classic and a really special, spectacular book and it appears to be entirely out of print! Crazy! That's really weird about The Stars My Destination. Arguably that's a better known book than Bester's The Demolished Man, but that one still seems to be in print.